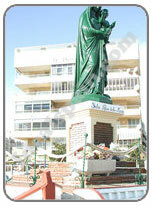 Carmen - Queen of the Seas and protector of fishermen is how the Virgen El Carmen is described. In the province of Malaga on the 16th July, hundreds of thousands of people will arrive on the coast to pay their respects to the Virgin. The entire coast will consist of Mass, vigils, processions, cultural events and sporting tournaments. Each resort has it's own unique traditions which often include carrying the image of the virgin through the town and along the beach. The virgin is then carried carefully into the sea. In Marbella, the virgen arrives by boat as doves are released. In some places sardines are served on skewers and are washed down with copious amounts of sangria. In Malaga divers bring up an iron image of the virgin that has rested on the seabed all year. In Los Boliches the virgen is carried from the church, through the town and into the sea. She will return to the church well after midnight. Despite the lack of coastline, Carmen is also celbrated inland in places such as Yunquera, Alhaurin de la Torre and Antequera.